During the gasoline shortage caused by World War II biomass gasification was used extensively throughout Europe, Asia and Africa to power conventional internal combustion engines. 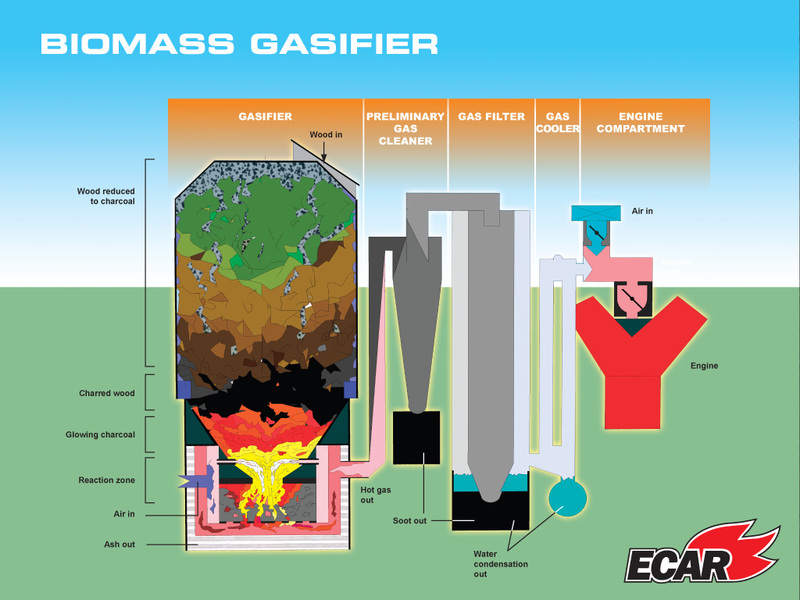 Biomass gasification is the process of breaking down and rearranging the primary components of plant material by partial combustion. Wood, for example, is composed primarily of carbon and hydrogen. In normal combustion wood produces H2O and CO2, the gaseous components of smoke. By burning in an oxygen deficient environment, however, the hydrogen in wood cannot acquire oxygen, thus creating hydrogen. No oxygen is available for the production of CO2, thus CO or carbon monoxide is formed. The CO is quickly converted to the nonpoisonous CO2 in the engine. The smoke from pyrolysis or the partial burning of cellulose such as wood, hay or corn stalks contains enough hydrogen and CO, along with a smaller amount of methane, to power a conventional automobile engine. The use of this gaseous biofuel in auto engines and even in boilers etc. is somewhat comparable to the use of propane or natural gas. 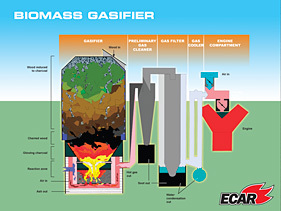 Schematic of the ECAR biomass gasifier. Click the image above to view a larger image. Copyright 2008-2012 ECON. All rights reserved.